I’m dealing with some other issues aside from diving, so I’ve been dry for the last couple weeks. The regular Sunday morning crowd here has been nonexistent the last two weekends. Apparently there was a birthday party here yesterday, and Father’s Day last weekend might explain it. It was extremely low tide. Out of the dozens of regular faces, Military Bob was the only diver that I recognized; he dove the 120 reef solo as nobody else had shown up. “Eight to ten feet at the very best and the swells are picking up,” was the report. A few new faces dove Terranea. 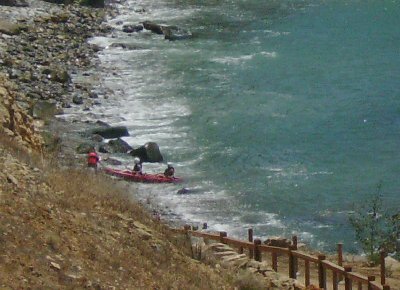 Terranea Resort is now offering kayaking from the rocks. Apparently, Pacific Wilderness will soon be offering “SCUBA Discovery” classes here. That will be really interesting as the only place at the resort to safely submerge someone who has never been diving would be the pool; the rocks would simply make it too dangerous. I debriefed with Military Bob for a good hour or more; no hassles so far, but we’ve all kept extremely low key. Actually, we take better care of this place than the guests; we clean up after ourselves, but the guests leave empty martini glasses and cigar butts all over the property – I guess the “help” is expected to clean up after them. The conditions have kept a lot of the regulars away. 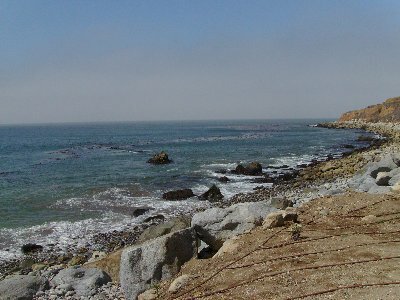 Merry and I dived there on Thursday afternoon, but we had 2-4 feet vis. On Saturday the water was muddy, so we had Evil Jeff’s Birthday at the picnic area, then on to his house later. Hopefully we’ll get some vis soon. It doesn’t seem to be caused by a plankton bloom. It was mostly sand stirred up by the surge. PSD, I’m finishing up a vacation in the Dominican Republic, then have a week back home. Back on the grid the weekend of the 18th. Sounds like I didn’t miss much given the limited vis in Cali. Maybe by then vis will clear and we can reconstitute our debriefing army.